This article is about the best Dwarf Hamster Cages available to buy online and in pet stores. Most hamster cages on the market are aimed at the larger Syrian hamster. Dwarf hamster requirements differ slightly especially if you have more than one living together. Buying an appropriate cage that is safe, secure and entertaining for your hamster is the most important decision you will make for their well-being. Hamsters can be housed in Cages or Glass Aquariums. Also available are dedicated colorful Habitrail homes with compartments, tunnels and built in playing apparatus. It is important to remember that dwarf hamsters are smaller than the Syrian hamster and thus making them more capable of escaping through large gap bars and other weaknesses a cage or tank might have. Savic Mickey Cage - Comes with metal-wire platform, water bottle, hamster house, wheel and feeding bowl. Solid metal cage. Made in Belgium. Ferplast Hamster Cage - An original design of wire net structure and high transparent plastic bottom where your dwarf hamsters could dig and hide in the bedding. Habitrail OVO Dwarf Hamster Habitat - Modular dwarf hamster home utilizes the smaller tubing of Habitrail Mini trails and is fully compatible with all other Habitrail add-ons. Habitrail Cristal Cage - Safe & Durable habitat for Dwarf Hamsters. Allows easy inter connect-ability with other habitrail items such as tubes and other cages. Excellent air circulation & easy to clean out. 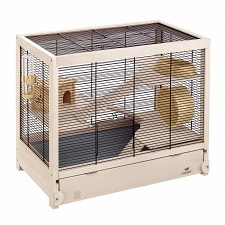 Kaytee CritterTrail Extreme - Two-Floor design for maximum exploring space for hamsters. Made of robust plastic & easy to clean. Includes accessories. 5 What is the Best Dwarf Hamster Cage? The bigger, the better for your hamster, however, a basic rule to go by is to make sure you have at least 1 square foot per hamster. A Hamster Cage with a wire top is traditionally the most popular type of home for rodents of all kinds. They also represent the cheapest you can buy. They are lightweight and easy to move and clean out. Due to their size – Dwarf Hamsters are excellent escape artists and wire top cages present them with the most opportunities to get away, especially smaller dwarfs like Roborovskis (Robo Dwarf Hamster). It is important to choose a cage with narrow bars and with no holes or gaps that will allow them to escape. Metal bars offer more room for mounting houses and toys on the bars allowing for room underneath for hamsters to roam. Running wheels can be easily attached and made unmovable. There is a wide variety of Dwarf Hamster Cages on the market today varying in price, size, quality, and accessories. Another factor to consider is noise – Hamsters gnawing at the bars all night can be very annoying if kept in a bedroom or close. My favorite type of enclosure because the glass gives a beautiful unobstructed view of your pet hamsters as well as eliminating the noise of hamsters gnawing metal bars at night time. Tanks are not as easy to manage as cages and can be quite cumbersome and tedious to clean. Aquariums must be well ventilated at the top because of ammonia build up from urine which can be harmful to your pets. Dedicated Fish tanks usually do not have suitable tank toppers, and you would need to make a DIY one made out of mesh or something similar to ensure adequate airflow. If your tank is tall enough, you could get away with not having a top. My favorite choice for Dwarf Hamsters is the Zoo Zone line up of small animal habitats. Zoo Zones are primarily marketed towards Rabbits and Guinea pigs, but they make excellent hamster homes because of their size. The most expensive dedicated hamster homes offer the best and most varied housing for your hamsters. It can be very fun and rewarding for you and your hamster to build your home made hamster heaven made up of tank units, tubes, tunnels, and little nesting boxes for your hamster to roam around and explore. There are a few downsides such as the tediousness to clean the individual components, and these habitats are more expensive than cages and tanks. Take care when choosing a hamster habitat, as most are dedicated to Syrian hamsters, making it difficult for dwarf hamsters to explore – especially the tubing. Choose one with ‘ladder rings’ inside the tubing. Kaytee CritterTrail Extreme Challenge Habitat is an example of a beautiful small cage for a single dwarf hamster. It is just the right size, and it has a good variety of tubes and toys to keep your hamster entertained. What is the Best Dwarf Hamster Cage? It is our opinion that the best hamster cage for Dwarf Hamsters is open plan style tanks and large cages. Dwarfs are social animals and live with others of their kind. Habitats with tubes and compartments can encourage territorial behavior and fighting among them. An added advantage to having open plans style habitats is the ability to have multiple hamster wheels and bowls which also helps to prevent fighting. Large Zoo Zone cages are perfect for dwarf hamsters.